John Maurice Hartman was a critically acclaimed, though never widely known, baritone jazz singer who specialized in ballads. Born in Louisiana, but raised in Chicago, he began singing and playing the piano by age eight. Hartman attended DuSable High School studying music under Walter Dyett before receiving a scholarship to Chicago Musical College. He sang as an Army private during WWII but his first professional work came in September 1946 when he won a singing contest awarding him a one-week engagement with Earl Hines. Seeing potential in the singer, Hines hired him for the next year. Although Hartman’s first recordings were with Marl Young in February 1947, it was the collaboration with Hines that provided notable exposure. After the Hines orchestra broke up, Dizzy Gillespie invited Hartman to join his big band in 1948 during an eight-week tour in California. Dropped from the band about one year later, Hartman worked for a short time with pianist Erroll Garner before going solo by early 1950. After recording several singles with different orchestras, Hartman finally released his first solo album, Songs From the Heart, with a quintet for Bethlehem in 1955. Releasing two more albums with small labels, neither very successful, Hartman got a career-altering offer in 1963 to record with John Coltrane. The saxophonist likely remembered Hartman from a bill they shared at the Apollo Theater in 1950 and later said, “I just felt something about him, I don’t know what it was. 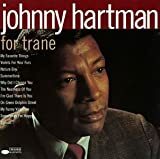 I like his sound, I thought there was something there I had to hear so I looked him up and did that album.” Featuring all ballads, John Coltrane and Johnny Hartman is considered a classic. This lead to recording four more albums with Impulse! and parent label ABC, all produced by Bob Thiele. With the 1970s being difficult for singers clinging to the pre-rock American songbook, Hartman turned to playing cocktail lounges in New York and Chicago. Recording again with small labels like Perception and Musicor, Hartman produced music of mixed quality as he attempted to be viewed as an all-around vocalist. Referring to his approach to interpreting a song, Hartman said, “Well, to me a lyric is a story, almost like talking, telling somebody a story, try to make it believable.” Returning to the jazz combo format of his earlier albums, Hartman recorded Once in Every Life for Bee Hive, earning him a 1981 Grammy nomination for Best Male Jazz Vocalist. This was quickly followed up by his last album of newly recorded material titled This One’s for Tedi as a tribute to his wife. In the early 1980s Hartman gave several performances for jazz festivals, television, and radio before succumbing to lung cancer at age sixty. His reputation grew considerably in 1995 when the soundtrack to Clint Eastwood’s The Bridges of Madison County featured seven songs from the then out-of-print Bee Hive album. With the renewed public interest in his deep-voiced, romantically charged ballads, all the music from Hartman’s solo albums and most of his earlier singles have since been reissued. Considering the nearly unanimous critical praise Hartman received during his life, it is unfortunate greater popularity always seemed to escape him.